Madley, UK. 27 June 2017. 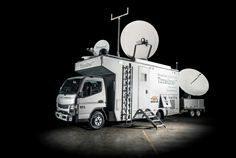 ETL Systems, a global designer and manufacturer of RF signal distribution equipment for satellite communications, has helped Timeline Television build its first UHD production/uplink truck – designated “RF1” – for use with major UK broadcasters. To meet its high demand in services, Timeline Television – a market-leading provider of broadcast technology – decided to build the RF1 as a six camera UHD production truck that is also able to operate as a communications vehicle, with two powerful independent transmission paths with dual chain redundancy. Timeline Television enlisted ETL engineers to provide components to handle the routing of various L-Band signals around the transmission paths. ETL supplied L-Band splitters and combiners for the RF tray, which allowed it to correctly route all signals around the two dishes easily. ETL also adapted the order throughout the process as Timeline Television changed orders and designs to better suit the direction of the project. The vehicle – which is now fully operational – has been busy since operating throughout the UK. With a solid history of quality editing for post-production and live programming, Timeline TV is a recognized and reliable name in UK broadcasting. All of the UK’s networks have trusted Timeline to deliver technical and creative facilities for programmes as diverse as live music and awards shows, political conferences, global and domestic sporting competitions, light entertainment and current affairs. Timeline takes pride in an ability to provide innovative, leading edge broadcast solutions, and a willingness to offer flexible, value-for-money services, which are tailored to the needs of each client. Uniquely in the industry, Timeline has the ability to provide facilities for your production from concept to completion, including: outside broadcasts, post production and an exhaustive knowledge of tapeless solutions. With two large post production facilities in London and a third in MediaCityUK, Timeline provide state-of-the-art facilities to major broadcasters including BBC, BSkyB and ITV, to name but a few.